Say, Buddy. Got time to explain something to me? Can you explain something to me? I heard Paul Ryan at his press conference describe how the new tax code will help America “recover.” And to give an example of how cutting the corporate tax to 20% will bring American businesses back, he used an example from his own state – Wisconsin. He said the biggest company headquartered in Wisconsin used to be Johnson Controls (or something like that), but they’re not there anymore. Instead, they’ve moved their business to Ireland where the tax is something like 12.5%. But when America cuts its tax rate to 20%, the company will come back and build new buildings and hire new workers. Now I know my mind’s been clouded by all those years of teaching and defending the teaching of critical thinking. But I don’t even need to use critical thinking to figure out that 12.5% is significantly less than 20%. So are the operators and stock holders of Johnson Controls, who moved the company from America because they wanted to go where the tax was lower, just not smart? If that’s not the case, why will they be bringing the company back to America? Maybe it’s just something about trickle down that I don’t understand. In all seriousness, I’m curious. And I have a question that I invite astronomers, physicists, or mathematicians, none of which I am — beyond that of a lay person’s dabbling, — to answer. By way of preface, I watched a number of you tube explanations of an expanding universe in hopes of finding an answer to the question I’m about to ask. Some were fascinating, some were boring. But two different approaches to explaining what scientists think we know, while effectively demonstrating expansion, clearly illustrated the nature of the problem the question addresses. The expansion of the universe is at the heart of the inquiry. One of the explanations invites us to consider the universe as a balloon. Dots on the balloon represent the galaxies. As the air fills the balloon, it expands and the dots move farther and farther apart. The other explanation, which I like better because it illustrates the same principle in a more realistic, complex way, compares the universe to a loaf of raisin bread baking in the oven. As the bread rises, the raisins separate and move farther apart throughout the loaf. So now to the question. 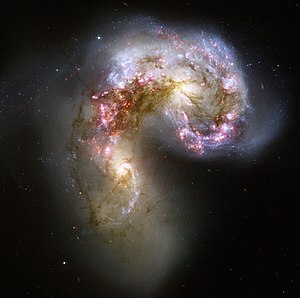 We know for a fact that galaxies collide. The Hubble Space Telescope, named for the astronomer who gave us the concept of an expanding universe, has captured images of it happening. The collisions are dramatic, chaotic, beautiful, frightening, and at the heart of both endings and beginnings. We also know by witnessing the phenomenon of the red shift that the universe is not only expanding but doing so at a continuously increasing rate. All of which brings us to the question. On the Poetry Editors and Poets list on LinkedIn, there is an ongoing discussion on what exactly is stream of consciousness and how is it used in poetry. One poster has called for members to post examples of stream of consciousness poetry. Here is my contribution. It is a poem I wrote when I was in graduate school and entered in a competition for graduate student poetry. It won honorable mention. Donald E. Carr points out that the sense impressions of one-celled animals are not edited for the brain. “This is philosophically interesting in a rather mournful way, since it means that only the simplest animals perceive the universe as it is”. one could soar too high. restore a sense of order to chaotic days. foremost resides a sense of order. You know who I am. Look down. You’ll find me trampled under foot. We made fires in the cleared fields. lifts to take a beer. and none of us was eager to go. being the only sane one. You weren’t there to see. My Lai’s only a match flame. the fan, it moves so slowly. embarrassed you with too loud talk. to look into, so mine teach you nothing. there’s only idiots who see what is. reaching to pick an apple. He fell and was drowned. No quail were left in the field. In my yard I come and go. my cat has brought home to share. Where Einstein feared to tread. Even if you’re not sitting around contemplating either the very large or the very small universe, you owe it to yourself to watch this and then go to YouTube and subscribe to acapellascience. The probabilities are endless. Galaxies colliding inside the head of a pin. And if you want to know how to say hello in Russian, you can find out here.